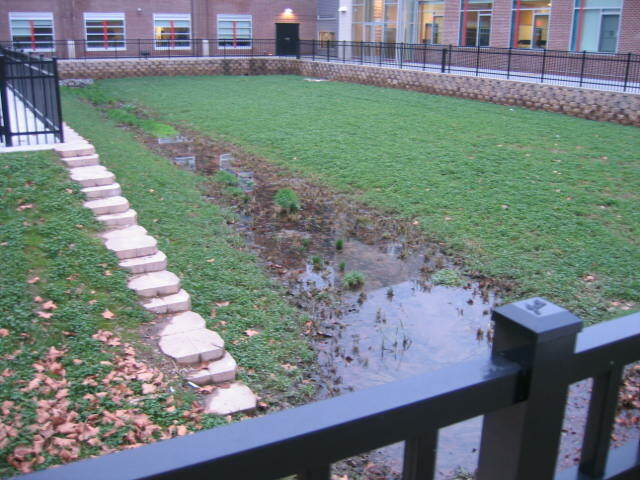 Here's a typical detention basin, a required feature in any new construction. They dot the Princeton landscape, mostly at housing developments. 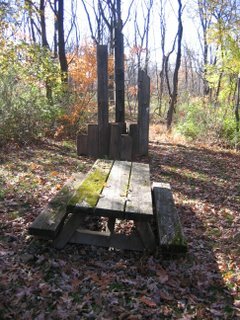 This one happens to be at Farmview Park, a new township park on the Great Road, across from Coventry Farm. They are curious structures. Down their middle is what has been called a "Sidewalk to Nowhere" that deadends at a concrete mausoleum-like structure. Stormwater enters one end of the basin, runs down the sidewalk, and drains out at a controlled rate through the concrete tower. During heavy rains, some water will be held back in the basin, reducing flash flooding. Though the basins have their use, I don't think "turf pit" is too unflattering a name. They aren't pretty, require frequent mowing, and offer no habitat or recreational value. Here's another, more gentrified basin, brand new, nestled between the two new wings of Princeton High School. It receives not only runoff from the roof, but also gets steady infusions from the school basement's sump pump. Dreams do not often feed on such prosaic fare as sump pumps and detention basins. 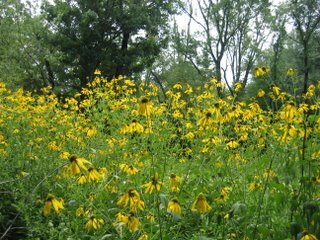 But I look at these basins and see something akin to an open-hulled Ark--precious wet, sunny, legally protected real estate where some of the prettiest and toughest of New Jersey's native wildflowers could flourish. Two such transformations may actually happen this coming spring, judging by the strong support thus far from Princeton Township and Princeton High School administrators, board members and teachers. 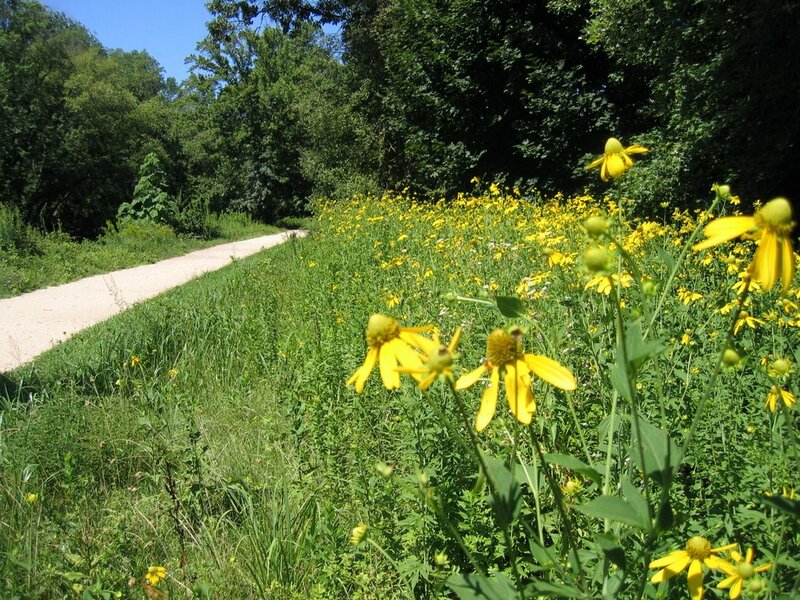 Funding and expertise has been offered by Partners for Fish and Wildlife, an agency in the federal Fish and Wildlife Service. Working for Friends of Princeton Open Space, my role in this is as catalyst with phone calls and emails, suggesting there's an opportunity and bringing the people together who can make it happen. 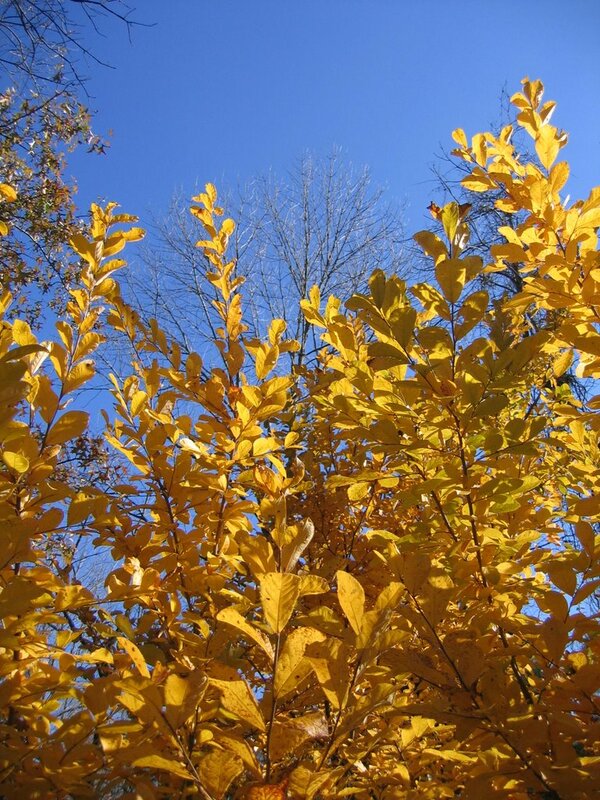 Then, if all goes well, there will be some attention to pay to all the plants put in, to nurture them while they get established, to prevent aggressive weeds from moving in, and to add more native species as time goes on. 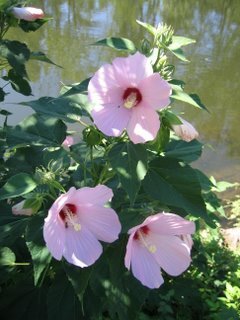 Pictures of a few of the wetland species to be planted--Hibiscus, cutleaf coneflower, etc.--can be found in earlier postings on this weblog. 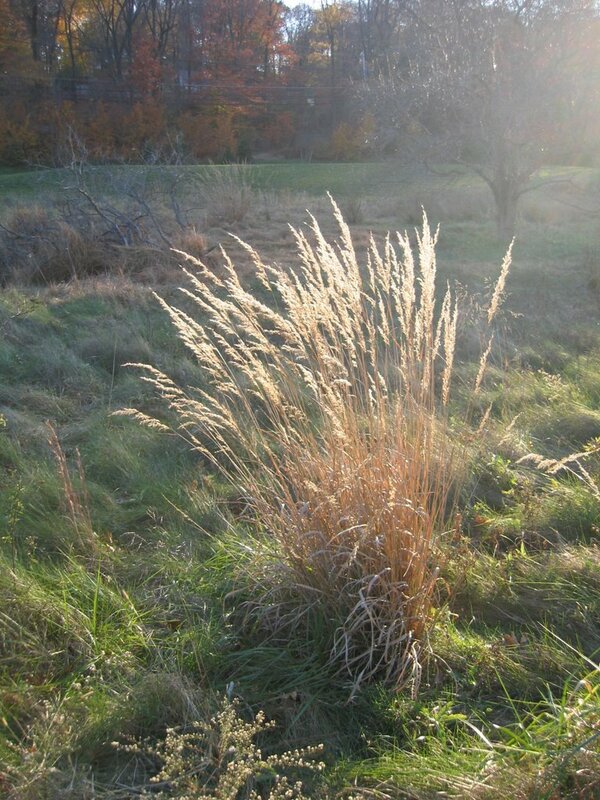 Prairie grasses will be planted on the upland edges of the basin. 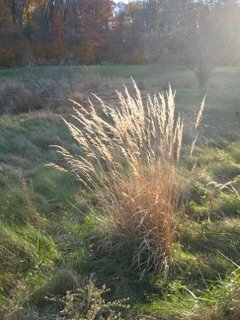 Below is a photo of Indian grass, a constituent of tallgrass prairies in the midwest that is also common on the outskirts of Princeton. Build the habitat and they will come. Midday on November 15, our dog Leo barked at the backyard from his perch next to the bay window. I always find his sharp bark irritating, but I soon thanked him for drawing my eye to the window just in time to see a great blue heron flying up and out of our backyard. I had been waiting for this moment since digging the miniponds a year ago. Great Blue Herons are glamorous symbols of wetlands, but they haven't let it go to their heads. They are not above showing up in someone's less than sprawling backyard and taking a peek and a poke at a Puddle With An Attitude. The miniponds have been attracting lots of birds, but the heron's visits over two days mean that our backyard habitat is now Heron-Certified. I'd like to think it was impressed with all the native wetland plants I had added, but truth be told, a great blue heron would visit a bathtub in a sea of turfgrass if it thought there might be a fish to be had. As it happened, we were wondering what to do with the goldfish that had grown sizeable over the summer and given birth to another generation. Would they make it through the winter, or should we go to the trouble of keeping them in an aquarium until spring? The heron provided an elegant, flattering and educational solution, though I doubt the fish were happy. 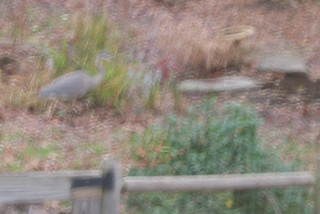 Below are some photos--not the best, since they were taken through a window, but seeing is believing. 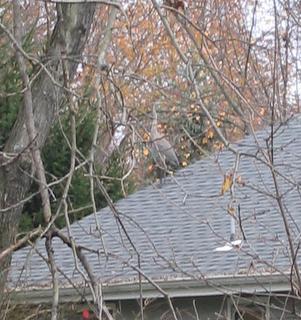 In the second photo, the heron is perched on the neighbor's roof, probably digesting its lunch before heading off to the next fishing hole. Yesterday, early on in the ritualistic walk around the block with my dog, I spied a perfectly fine plastic bucket that had been put out with someone's trash. Remembering all the times I had searched in vane for the bucket we have, I snapped it up before its useful life could be cut short by the giant maw of a garbage truck. Around the corner, I got a strange look from a passerby. Small dog, big bucket--she must have wondered what I was expecting little Leo to produce during our walk. These walks, short as they are, seem to make the dog's day. For him, it must be like checking email or reading the newspaper. Sniffing about, he gets updates on who's been in the 'hood, and may well pick up on subtleties of mood, health--who knows what all a nose can read about the world. If not for kids and a dog, I might know little of this town. Certainly I wouldn't have seen the spectacular migration of geese the other day, flying high over the park as Leo kept his nose to the ground. There was a first wave, with maybe seven "V"s constantly shifting, merging, breaking off to form new configurations. Then another wave even bigger, and another. Five waves in all, with "V"s as populous as 100 birds, and waves of 3-5 hundred each. Counting distracted from my transfixion on the beauty of the patterns that abundance can make. Their calls were not the raucous complaint of geese flying into a local pond, but were sparse and melodious as they drifted down from great height. Whether they were truly migratory geese or the variety that stick around all winter only a birder could guess at. By the time I got home, they would be halfway across the county, their morning's ambitions far greater than mine, for some reason taking them northwest on a late autumn day. It's decision time. In the bear den, also known as my home office, the number of renewal notices from environmental organizations has reached intolerable levels. My processing method is to throw them in a pile as they come in, day after day, since there never seems to be a convenient chunk of time to deal with them. Which notice will get me to act? Will it be the seventh panda envelope from the World Wildlife Fund? The eighth? This has to stop. A large percentage of my annual donations is surely being turned into postage and paper in their dogged attempts to get me to send more. I finally sat down today with a computer and a phone and started calling, renewing online if I was put on hold. I was hoping they could automatically deduct annual dues from my credit card each year, but the best they could do was promise to limit renewal notices to one. We'll see if they live up to the promise, and whether one notice is enough to trigger my renewal. For now, the pile has been transferred to the recycling bin, and one small corner of the bear den is more peaceful and ordered. 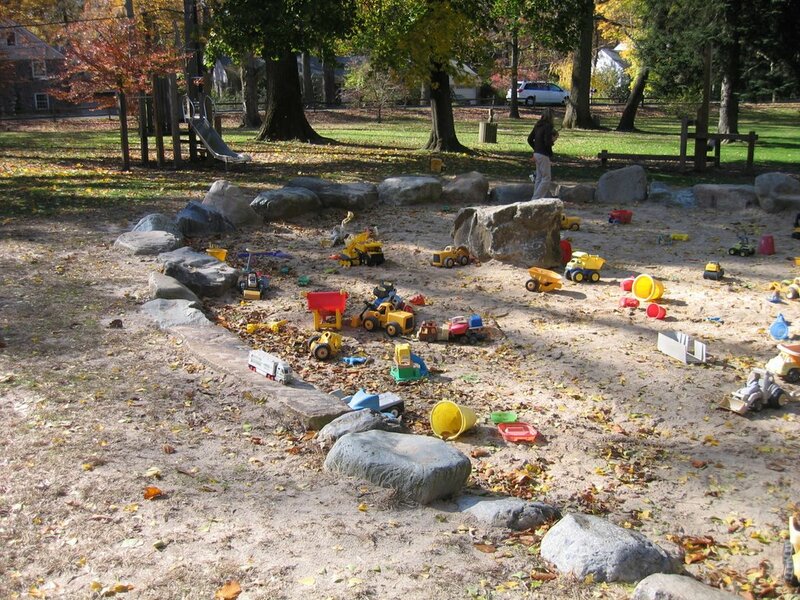 A fleet of miniature earth movers has been running roughshod over the sandy uplands of Marquand Park for years now, but the rest of the park appears to be safe from development. 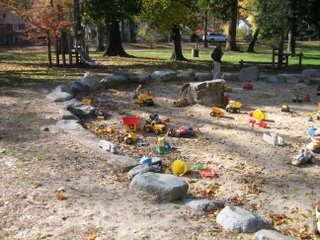 If you have young kids, you may, like me, have spent your time watching them sharpen their sense of balance on the rocky ring rather than venturing down the trails leading into the rest of the park. It can be a surprise then, after the kids have miraculously reached school age, to find yourself with free time, a camera and an autumn afternoon to see what lay just beyond the playground. Princeton. 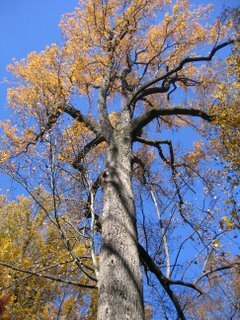 It's not easy to capture a tree's size in a photo, but here is a tulip poplar. 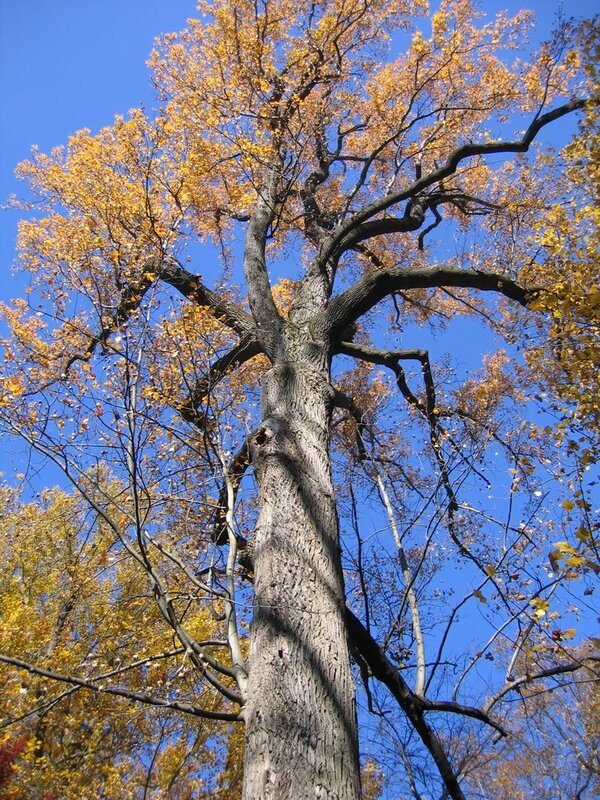 Native trees of this stature speak to the grandeur that the first colonists must have encountered. The more recently regrown forests that occupy most of Princeton's open space have a long way to go before they reach this stature. 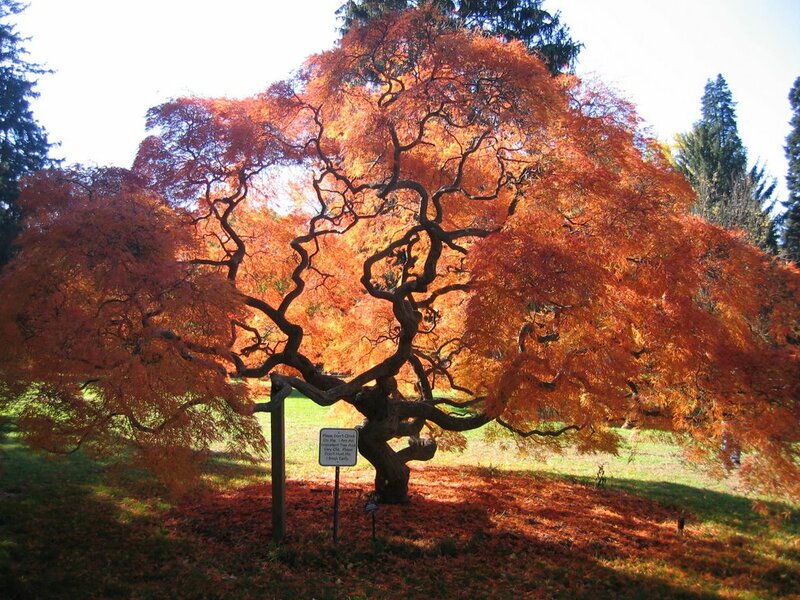 Marquand Park also has its share of exotic trees, most of which are not of the invasive variety. Below is an otherworldly threadleaf Japanese maple, its brilliant colors backlit by an afternoon sun. The October 28 nature walk, like those before it, was preceded by a spectacular dumping of rain that lasted long enough to insure no attendance, then stopped minutes before the scheduled start. I showed up to lead the nature walk anyway, though I was sure the weather had discouraged any and all. 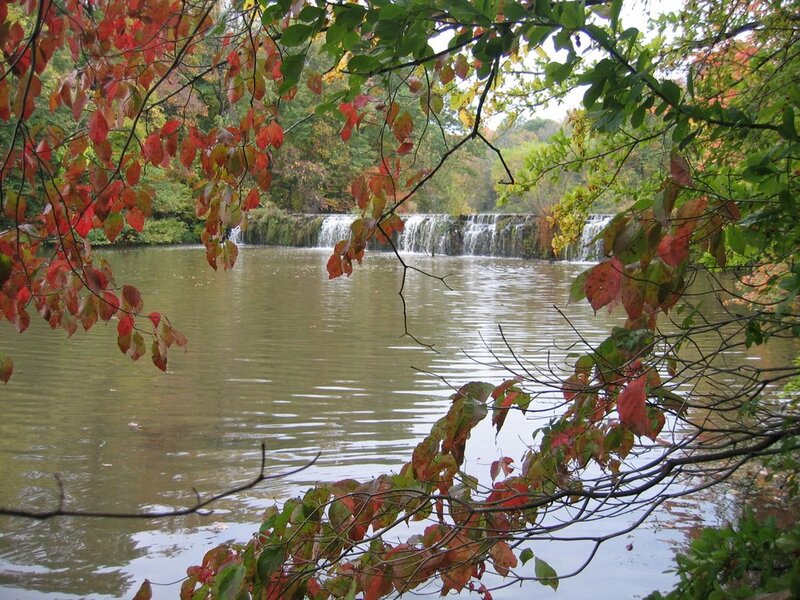 The big draw was the ephemeral creeks, one of which, flowing briskly alongside Valley Road, swelling into ponds where the leafpiles formed dams, nearly stalled out my car. The rain stopped right around 9am, and the surprisingly balmy mistyness had an exhilarating effect, as did the findings of an hour and a half exploring the woods of Community Park North. 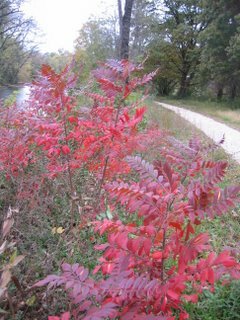 The parking lot serves as the headwaters of a fine ephemeral creeklet that during and after a good rain heads off through the woods, past exotic Asian Photinia (photo) and native spicebush, then down through a grove of swamp white oaks. The various trails that used to lead into this area, which also hosts some nice, squishy sedge meadow openings and a view back across Pettoranello Gardens, are mostly defunct. I progressed through the tangle of exotic shrubs only with the help of a trusty pair of hand clippers. 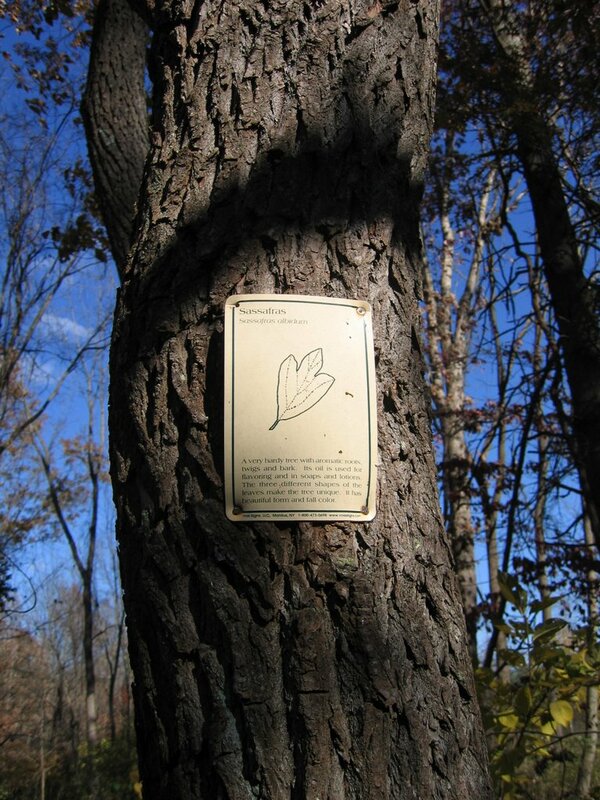 Some of the trees announce their identities, and give clues as to where the trails used to be. 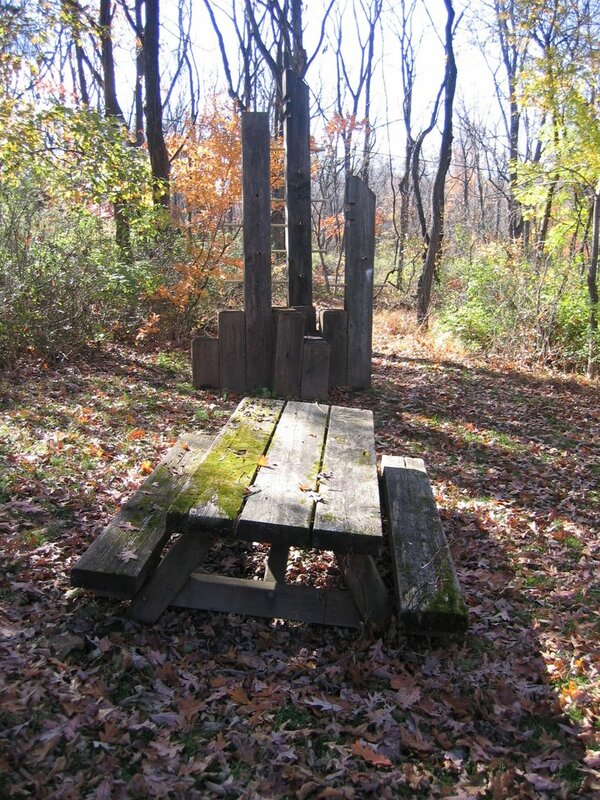 Very sturdy picnic tables that look like partially sunken battleships, and some totem-pole-shaped climbing structures surrounded by invasive thorn bushes, add a lost culture kind of feel. 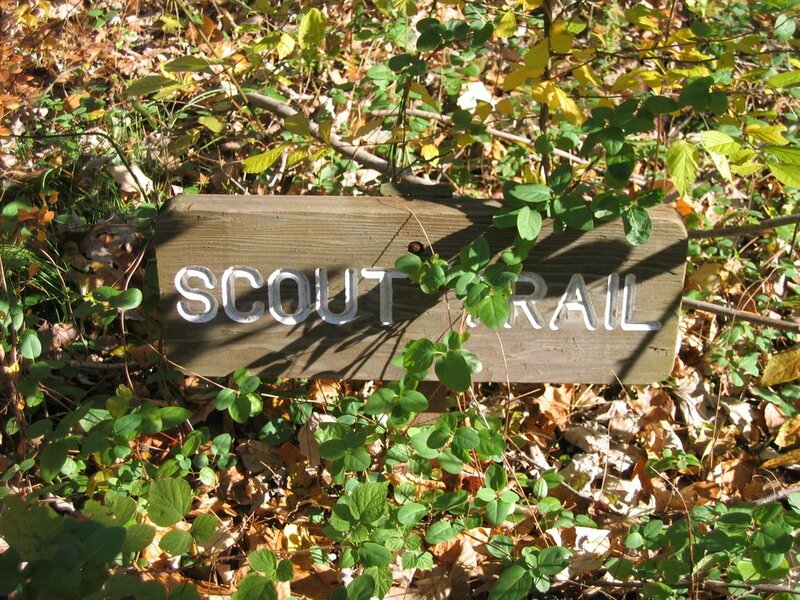 Across the branch of Mountain Brook, another ephemeral creek flowed down through the evergreen forest. 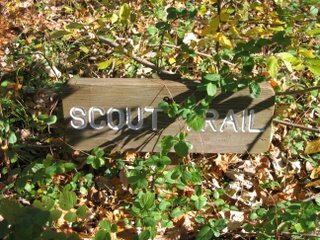 Nothing grows under the thick shade and pine needle mulch except a few patches of Japanese stiltgrass, so it's one of the few woods around where one can easily get off the trail and head cross-country. The clear views through the forest, and a group of five deer off in the distance, gave the place an old Disney movie feel, though in this updated version the deer have eaten all the wildflowers. A day later, the creeks would be dry and the balmy temperatures gone. 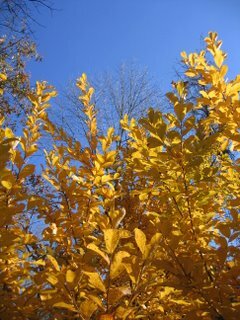 I was glad to have witnessed one of the woods' more unusual moods. 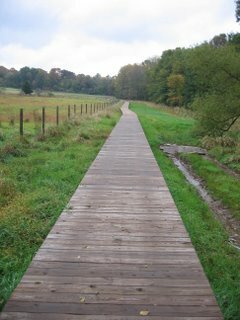 I didn't make it over to the boardwalk, though I bet it had some nice creeks flowing there as well. The walk will be rescheduled. 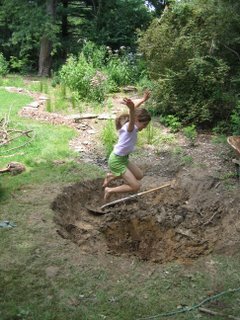 This pond is part of a hand-dug creekbed in a Princeton backyard. 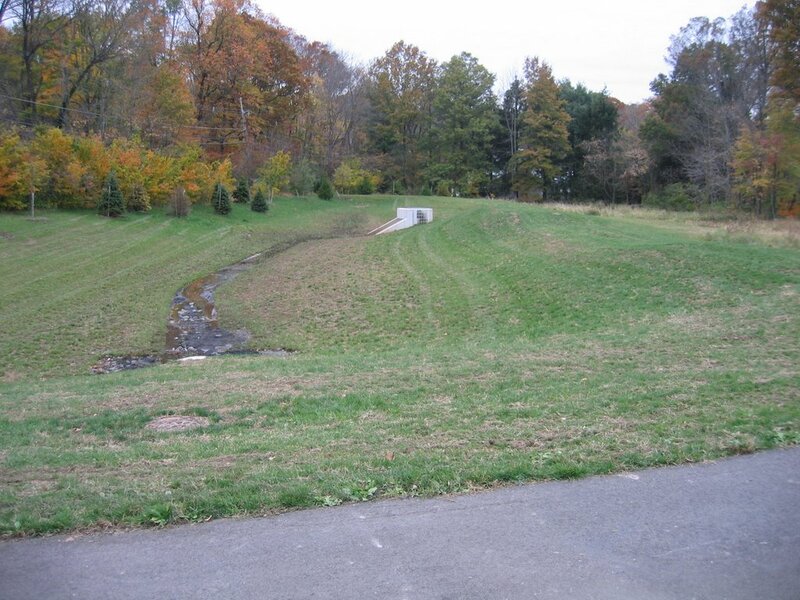 During heavy rains, runoff enters the creekbed from upstream neighbors’ yards. 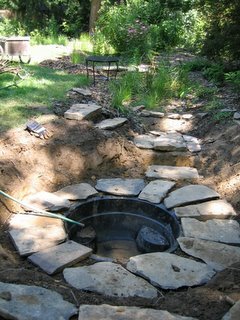 The runoff fills a series of mini-ponds and channels of varying depths. 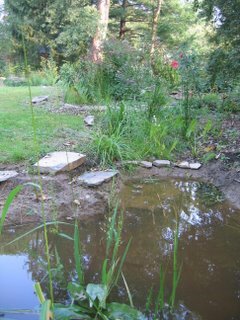 Most of the mini-ponds hold water for only a day or two after a rain, while others are deeper and have plastic liners in the bottom that hold water throughout the summer, providing habitat for mosquito-eating fish and various aquatic insects. The series of mini-ponds serve to hold back some of the runoff, which in turn feeds the many floodplain plant species planted in and around the ponds. 3rd Photo: A rain brings water—the pond is now home to water boatmen, water striders, goldfish and wild rice. Below are links to a September 13, 2006 Town Topics article telling how a new program of reduced mowing has allowed long-suppressed native wildflowers to bloom along the towpath in the Princeton portion of the D&R Canal State Park. It's a startling experience to suddenly be able to walk right up to a wild bird, to see the brilliance and incredible detail of their feathers close up. 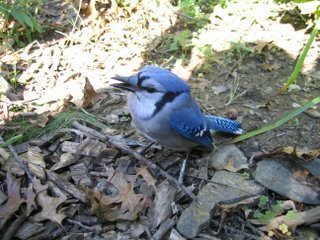 I found this bluejay standing quietly next to one of our backyard ponds late one afternoon this week, a few hundred feet away from busy Harrison Street. It showed no fear, no aggression. I went inside to get the camera and returned to find my daughters petting it. Only the tail feathers, bent at a strange angle, gave a clue as to why this bird did not flee our presence. The Mercer County Wildlife Center (609 883 6606) was closed, but their message said to put the bird in a shoebox and keep it there overnight without any offerings of food and water. The county naturalist (230-6439) answered his phone and suggested that the bird might be dazed from having hit a window. The tail feathers would have stayed in the position the bird was in when it hit the window. 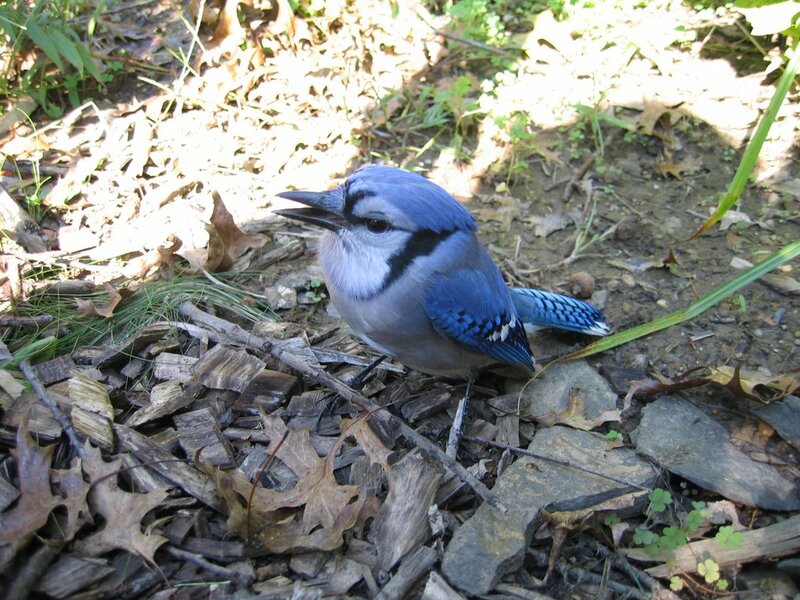 With time, the bluejay might recover its wits and fly off. 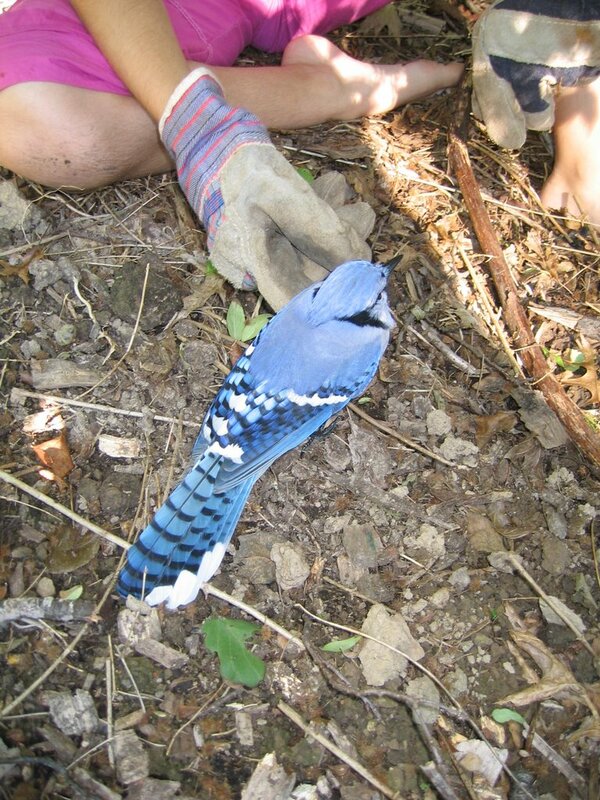 This, apparently, is what happened, since it flew up into a shrub when we tried to corral it into a box, and it was gone altogether the next morning. 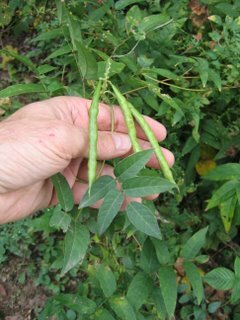 Two types of wild bean grow along the D&R Canal in Princeton. 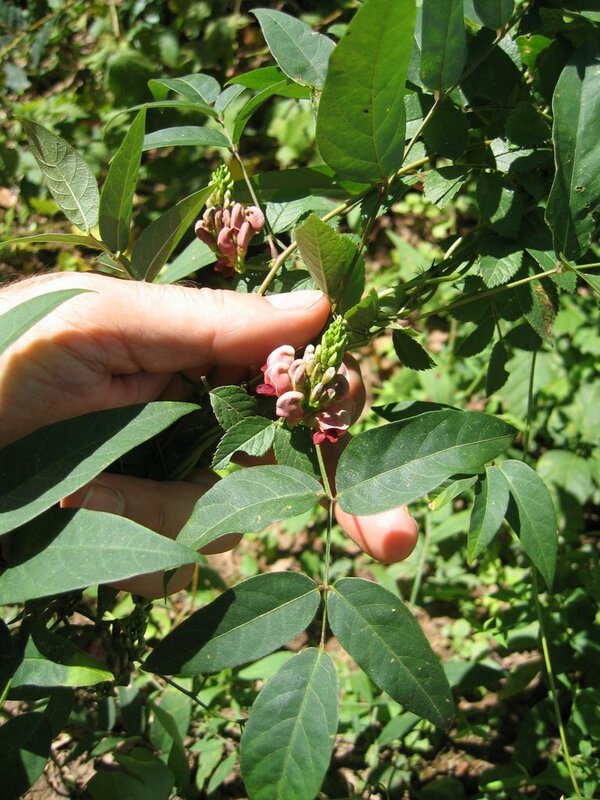 Groundnut (Apios americana) has reddish flowers in August followed by beans in September that look much like green beans you'd grow in your garden, but it gets its name from the edible tubers that grow along its roots. For details, see http://www.pfaf.org/database/plants.php?Apios+americana. 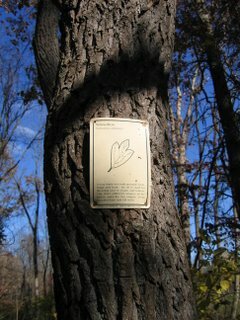 Note that each leaf has five leaflets. Hog peanut--another leguminous vine growing along the canal--has three leaflets. Asian wistera, fortunately not common in this area, has many more leaflets than either of these two natives. 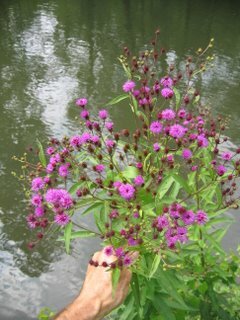 Here are a couple more showy native species that bloom along the D&R Canal towpath in August. 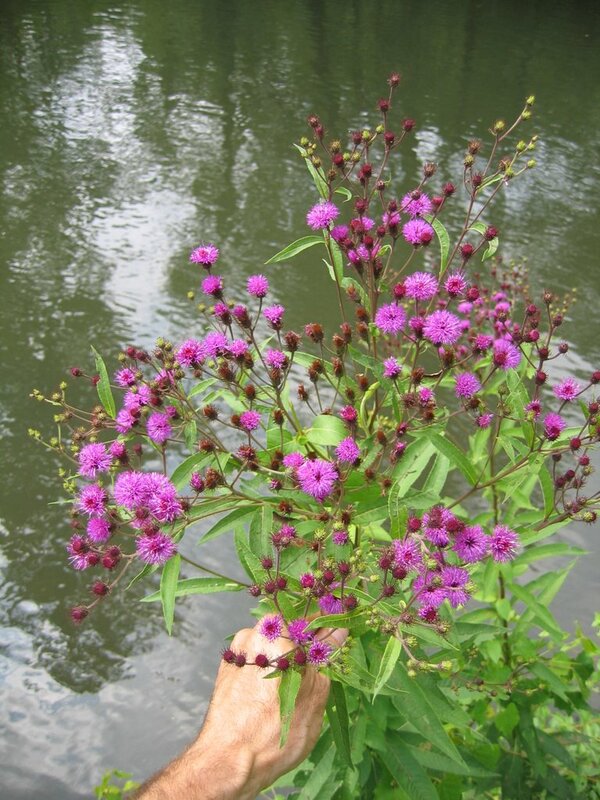 New York Ironweed, with disks of small purple flowers, likes a combination of wet ground and sunlight. The big flower with a rose center is called Rose Mallow Hibiscus. It typically grows at water's edge.